We provide a Washington DC area airport car service that is unsurpassed in reliability, quality and luxury. Our mission is to ensure that all of our clients / passengers are fully satisfied with the level of professionalism we maintain every step of the way. If you are traveling to or from the Baltimore or DC area, trust CHARGE AND RIDE LIMOUSINE Inc. to be at your service for all your airport transportation needs. In Washington DC metropolitan area, there is no better executive ground transportation service than Charge & Ride Limo Inc. With years of experience and a professional fleet of vehicles and chauffeurs, we make your travel experience enjoyable and memorable every time. Whether it's a limousine for corporate or private event or just a car service for airport transfer, travel between venues or other transportation needs, we are the premier provider of Washington DC limo services. We also offer exclusive luxury transportation for airport, weddings, proms, city sightseeing tours, and much more. If you have a need to travel to your destination in style with a professional driver, we are here to serve you. What's more, our prices are competitive in the market, with specials for weddings and proms. Our fleet includes Ultra-Stretch Limousine, Executive Sedan, SUV, Van, Mini Bus, and Motor Coach. We take pride in our vehicles and only offer the cleanest, most mechanically sound vehicles. When you travel with us, you will receive premium treatment and high quality service every time. 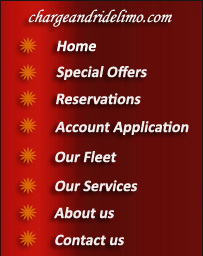 We also include several added perks with every vehicle. These can include cell phone usage, TVs and DVD players, surround sound systems, complimentary soft drinks, and much more. Book your transportation online with us today. We offer free online reservations and quotes, and you can also request receipt for your financial records directly from our site.